Size: 1633 sq.ft. - 2200 sq.ft. The Solitaire is an elegant residential apartment developed by the Kalpataru Group that is in the township of posh locality Juhu, Mumbai. Solitaire’s multi-storey apartments allowto enjoyall facilities and amenities to its residents for high standard of living. In this project the buyers can have selections of various types of bedroom flats. The flats are designed with the modern&world-class designs. You can buy these apartments and upgrade your standard of living. Kalpataru Solitaire apartments are surrounded by lush, green environment and you can enjoy the scenic view of the nature from the apartment balcony and for children it compromises of the big playground area.These apartments are under-construction now and the possession will be given soon. 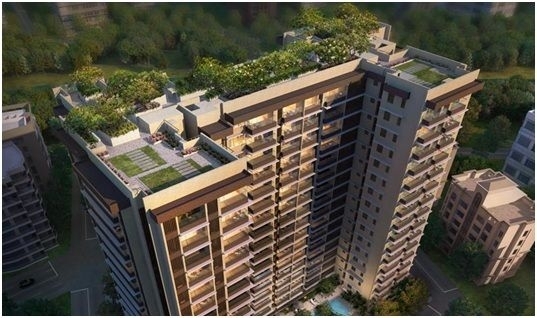 Kalpataru Solitaire is a lavish construction designed by the famous architect "Sanjay Puri". Unlike in any in the city – "The Solitaire" is one of the biggest developments in Juhu location by taking luxurious living to new heights with lavish 3 Bed& 4 Bed residences & luxurious amenities. Some of the finest comforts and shines the brightest are being offered by Kalpataru Solitaire development.The stylish Kalpataru Solitaire multi-storey 2 towers projectand is a home to 117 units along with rooftop features.These beautiful and marvellous apartments provide quite spacious flats of 3 bedroom units and 4 bedroom units. The elegant 3BHK flatsranges from1798 sqft to1843 sqftwith the available pricing of 66,666 per sqftand the master 4 BHK is available at the costing of approximately 88,888 per sqft with the carpet area of 2231 sqft to 2242 sqft. Kalpataru real-estate Company was established in the year 1969 by Chairman Mr. Mofatraj P. Munot. Kalpataru Group of companies is one of the leading real estate development groups in India. The current project of Kalpataru Group is Solitaire is a luxury landmark in the Juhu skyline.The focus has been on the development of premium residential, commercial, retail, integrated townships, lifestyle gated communities and redevelopment projects primarily in the Mumbai Metropolitan Region (MMR) & Pune. Also undertaking projects in other main cities of India such as Surat, Hyderabad, Chennai, Jaipur. The Kalpataru Group is quite experienced builder who have given us beautiful and luxurious apartments to live. The few of the main and popular projects are Kalpataru residence, Kalpataru Towers, Kalpataru Woods Ville and Kalpataru Aura. There are 10 upcoming projects by this builder. Kalpataru Solitaire is located in the main township of Juhu, Mumbai. These apartments are nearby maximum commercial locations. For travelling to school or office, you can connect with Versova Metro Station, which is quite near from these apartments. Apart from this, you can also have other major connectivity like Andheri Link Road, S.V. Road and Western-Express Highway. For the residents of these apartments all the commercial places are at the walking distance such as schools, shopping mall, hospitals, banks and more as these apartments are located in the posh area. The Solitaire by Kalpataru Group is strategically located at one of Mumbai’s most sought after destinations at JVPD, Juhu Skyline, Mumbai. 1633 sq.ft. - 2200 sq.ft.